Never Miss Another UPS Delivery Again! Get Realtime Delivery Updates for FREE! UPS My Choice is a FREE service that allows you to receive delivery alerts so you never miss a package, electronically authorize packages in case you're not home, send delivery to different location and much more! This is especially great for those who do a lot of online shopping or entering giveaways or sweepstakes. 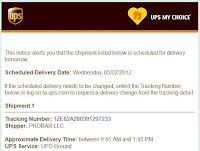 You can easily track your package and you'll get notified immediately after the package is dropped off at your house. This way, you don't have to worry about your goodies getting stolen for leaving them out front too long. Here's a personal example: I was expecting a box of ProBars to be delivered. Yesterday, I got an email stating what day and time the package will be dropped off. 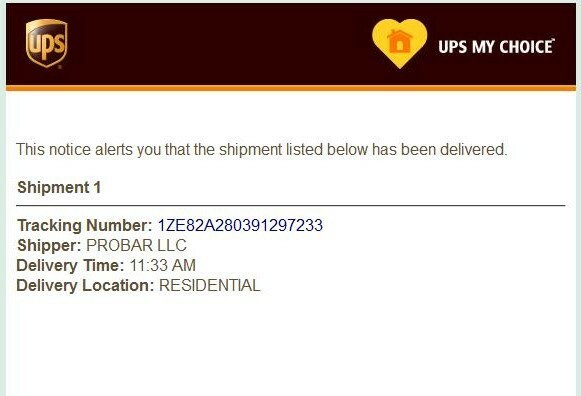 The very next day, I got an email letting me know that my package was delivered and at what time...in the same time frame the first email said it would! I was downstairs on the computer and didn't hear a knock on the door, but thanks to my email, I ran upstairs and got my box (before anybody else could!). This is a sponsored post for UPS My Choice. However, I use this program, love it and do recommend it!